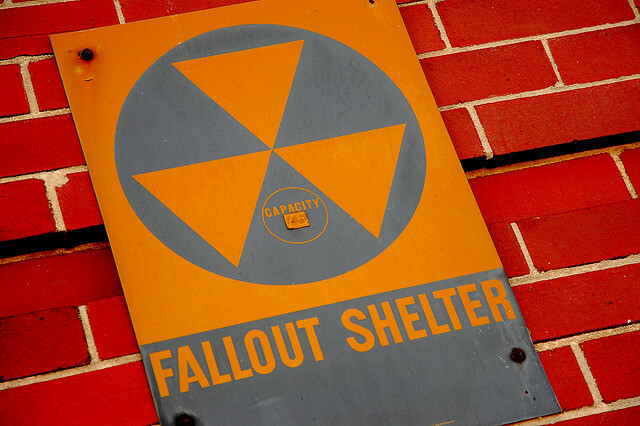 Are bomb shelters and underground bunkers the future we want? Photo: Steve Snodgrass via Flickr. Ongoing events in Japan should remind us how fragile our entire set of living arrangements has become. We understate risks and plow ahead with dangerously complex and transient nuclear projects because we believe we need electricity to survive. Gee, I wonder how they ever got along for the first two million years of the human experience? Since I first learned about global peak oil and its economic consequences, nuclear catastrophe has been my constant nightmare. Can you blame me? Japan is a harbinger of far worse events ahead. Until last year, Japan had the second-largest industrial economy in the world. It’s a country so deeply terrified of nuclear disaster that it’s taken the strongest steps to insure against natural disasters of all kinds. Yet all 13 backup diesel generators failed in the Fukushima one nuclear plant. Huh. How about that? Imagine the horrors when the diesel stops flowing to the world’s 442 nuclear power plants, many of which are found in countries with infrastructure and safety records far worse than we find in Japan. This is truly the stuff of nightmares. I’d hope world leaders would act appropriately about this, but I’ve lived long enough to expect otherwise. If I were king of the world for a day, I would immediately order a planned methodical shutdown and then closure of all nuclear power plants. The alternative is emergency shutdowns in myriad ways, all of them hasty and unplanned, as the world’s industrial economy continues its ongoing demise while the effects of climate change wreak daily havoc hither and yon. The results of deline and disaster are completely predictable and unimaginably horrific, and they include numerous core meltdowns and huge releases of radiation. The consequences of huge unplanned releases of radiation into Earth’s atmosphere include death to most, and perhaps all, land-dwelling species on the planet. Considering the interdependencies between terrestrial and aquatic ecosystems, the extinction of many aquatic species would follow on the heels of extinction of terrestrial species. Radiation is impartial. Radiation doesn’t discriminate. In short, the near-term consequences of nuclear catastrophe likely to result from collapse of the world’s industrial economy are unthinkable. So let’s put our hearts and minds together to think of something else. Something better. Unless gas masks and peeling skin are really your thing. If you enjoyed this article please share it and follow us on Facebook. With all of the issues that have been plaguing the nuclear industry since its inception, from permitting, citizen protests (NIMBY), safety issues, cost overruns, and dealing with the radioactive waste. It is no real surprise that this may be the final nail in the nuclear industry coffin. I am curious to see what the final body count will be since as of 8am today they announced that the top of one of the containment vessels has broken and the rods are directly exposed to the atmosphere. It is ironic that the nuclear industry got its start in Japan, Hiroshima and Nagasaki, and it seems that it will end with Japan. It is amazing how we have come back in a complete circle. Guy, usual good analysis. I would be glad to promote you as King for far more than a day. The interwoven nature of all of the support systems we have come to rely on should give anyone pause. Nuclear supplies electricity but can’t run if the grid is down. Diesel is the back up source to run the cooling system, but diesel engines can be flooded, or run out of fuel. Fuel, even if available, needs electricity to be pumped from storage and electricity to be refined. Interconnectivity works until enough parts fail and then one has a crash, in the case of nuclear the implications are as you note peeling skin and much worse. There’s nuclear nightmares, and then there’s SLAVERY nightmares. Yep, you heard me right. With fossil fuels peaking, we need a new energy staple; preferably one without carbon emissions. Wind and solar can’t replace fossil fuels (to low an energy density and energy received/energy invested ratio (AKA EROEI.) Nuclear power is the only technology we have that can stave off a new dark age, as economical fossil fuel energy becomes a thing of the past. Sadly, the current situation in Japan (involving reactors designed and built in the 1960’s, BTW) is likely to stiffen NIMBY opposition to nuclear power to an undefeatable level worldwide. And by the time people realize we HAVE to switch to nuclear power to prevent a Mad Max scenario for humanity, it will be too late as we won’t have the necessary fossil fuels to build a self-sustaining nuclear infrastructure. Something to think about, folks. Around 2400 years ago, a very smart guy by the name of Aristotle commented that slavery (a major institution of his era) was regrettable, but would be a fact of life until tools could move themselves. During the last 200 years, tools HAVE been able to move themselves (thanks to fossil fuels.) And legitimized slavery has disappeared in that time. Coincidence? Brendan — I often think about human labor in regards to our society’s descent from fossil fuels. If every person in the industrialized world has access to a couple hundred “energy slaves,” what happens when that energy starts to go away? And you mention Aristotle. I read somewhere that most democracies in history also had slavery, whether Athens, the Roman Republic or the US pre-1865. Is there a causal connection? Not sure. And I’m not sure what to think of nuclear power. But I do think we need to consider the implications on our social institutions very carefully when it comes to energy descent. We definitely need to consider that, but working on how to eliminate the hierarchal economy that allows slavery to develop will address that. If nobody can profit from forcing others to work, it won’t exist. Yes, most historic democracies had slavery, but then almost ALL state based systems of ANY kind did. So did some tribal cultures, but slaves there were in small numbers, generally ended up being adopted and became full citizens because creating a permanent underclass tends to destroy the unity of a culture that needs everyone to be basically equal to survive. The Fukushima meltdown was a ticking time bomb since it’s inception. Built on a earthquake fault, economic self interest once again triumphs over protests and concerns. In theory, we are told, nuclear energy could provide us with cheap, safe power generation. In reality, catastrophic events such as Fukushima, Chernobyl and Three Mile Island have poisoned the earth for generations and taken a human toll. Even if we close every nuclear power plant tomorrow, we still have the legacy of having to deal with the spent nuclear fuel. Who will be around for the next few more thousand years to ensure that the stored radioactive fuel remains contain? And will they have the ability or resources to deal with the mess we left them? Why are we not clamoring to put in to use product with the potential to revolutionise the power industry, and a safer alternative to uranium – Thorium oxide, which is three times more abundant than uranium, is also a radioactive material. Amazingly Senior research scientist Dr Hashemi-Nezhad, from Sydney University, says it is safe to hold in your hand. “This is the future of the energy in the world – energy without green, without greenhouse gas production,” he said. Dr Hashemi-Nezhad says thorium has all of the benefits of uranium as a nuclear fuel but none of the drawbacks. Because thorium reactors will make nuclear reactors more decentralized. Because of no risk of proliferation or meltdown, thorium reactors can be made of almost any size. A 500 ton, 100MW SSTAR-sized thorium reactor could fit in a large industrial room, require little maintenance, and only cost $25 million. A hypothetical 5 ton, truck-sized 1 MW thorium reactor might run for only $250,000 but would generate enough electricity for 1,000 people for the duration of its operating lifetime, using only 20 kg of thorium fuel per year, running almost automatically, and requiring safety checks as infrequently as once a year. That would be as little as $200/year after capital costs are paid off, for a thousand-persons worth of electricity! An annual visit by a safety inspector might add another $200 to the bill. It can generate power without emitting greenhouse gases and it can be used to incinerate the world’s stockpiles of plutonium. Dr Hashemi-Nezhad says thorium waste would only remain radioactive for 500 years, not the tens of thousands that uranium by-products remain active. “In fact, the green movement must come behind this project because we are moving in a direction to destroy all these existing nuclear wastes, to prevent nuclear weapons production, to prevent Chernobyl and the more recent accidents in Japan happening again. Basically Th would be used in Pebble-bed reactors which by design cannot suffer melt-downs of the type experienced in Japan.